©Bert Gildart: Though not as beautiful as are many of the other species now attracted by our feeders, nevertheless, the bland-appearing cowbird is a species of great fascination, essentially because of a habit it developed from a long ago association with a most formidable mammal. Cowbirds do not build nests, rather they parasitize the nests of others, and prolonged studies reveal cowbirds will lay eggs in the nests of at least 220 unsuspecting species. Further studies show that over 140 species of surrogate “parents” have raised young cowbirds. So how did cowbirds pull off a trick like this? They accomplished the feat long ago learning from an association with the countless number of bison that pounded across the prairie. In those long ago times bison made annual peregrinations across the Great Plains of North America, and those herds numbered in the millions. As they migrated they stirred up insects and these bugs became an easy food source for any species that chanced to be in the area. 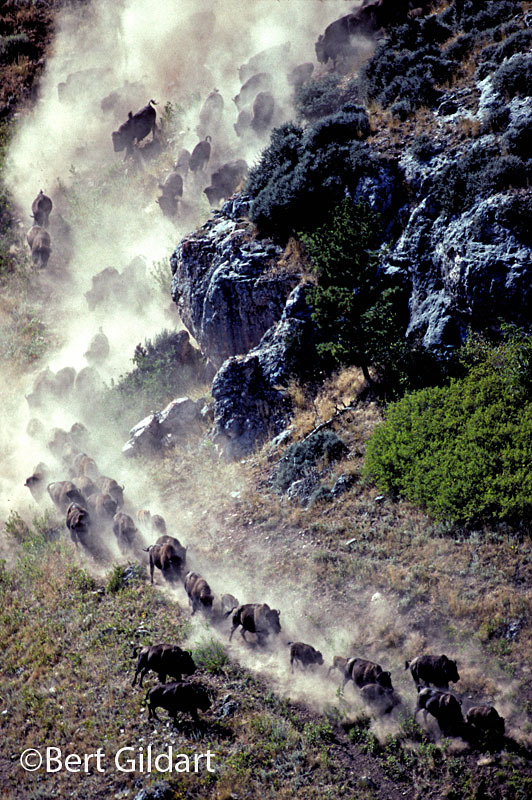 Cowbirds were present, but a problem existed for bison didn’t stay long in the same area. Rather, they moved, and when they did move, cowbirds lost access to their easy food source. The solution? 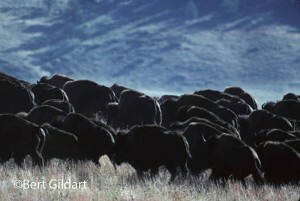 To eat, cowbirds had to move with the bison but that meant they couldn’t build nests. Further, that meant that any eggs they did lay would be abandoned. The solution was to parasitize the nests of other birds, leaving incubation and the feeding of young to all the hawks, finches, robins, warblers, and crossbills — birds who relied on other foods. Certainly not all these other species adopted the mottled eggs that cowbirds laid, but most were oblivious, meaning that populations of cowbirds thrived. Today, cowbirds still eat easy-to-gather insects because cattle stir the bugs just like bison did a century ago. And, so, today, even though the vast herds have been killed off, cowbirds continued with the parasitic trait they learned so many years ago. we still have a few remnant herds. 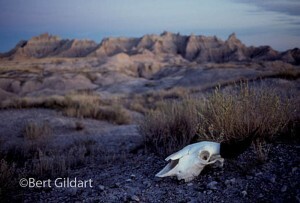 Bison skull, Badlands, N. Dakota is symbolic of vanquished herds. Fascinating, and I thought the information so exciting that I wanted to pass it on. Of course, I would not have been able to offer this information if a cowbird had not landed on my feeder, prompting me to grab for my field guide and confirm identification. But then I noticed that the guide offered an extensive discussion about the relationship with bison and bird, which I believed interesting. Cowbirds were there, but there was a problem, for bison didn’t stay long in the same area. Rather, they moved, and when they did move, cowbirds lost access to their easy food source. The solution? 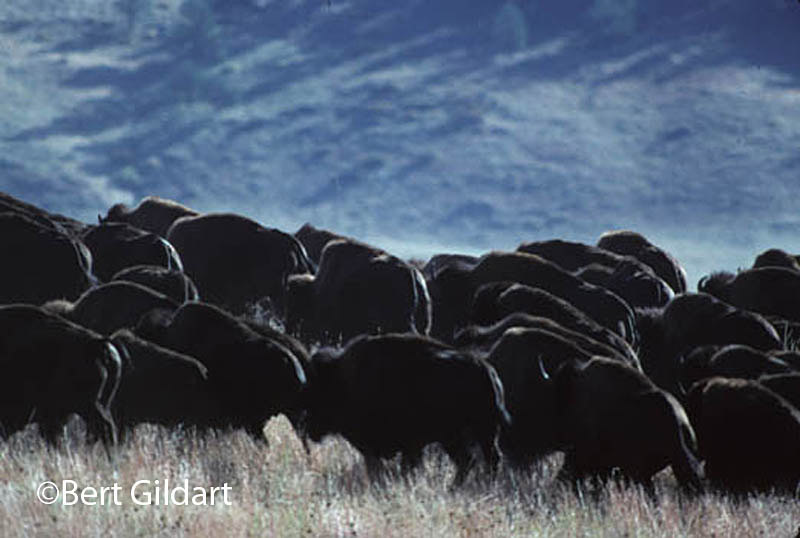 To eat, cowbirds had to move with the bison but that meant they couldn’t build nests. Further, that meant that any eggs they did lay would be abandoned. They solution was to parasitize the nests of other birds, leaving incubation and the feeding of young to all the hawks, finches, robins, warblers, and crossbills, birds who relied on other foods. Certainly not all these other species adopted the mottled eggs cowbirds laid, but most were oblivious, meaning that populations of cowbirds thrived. Today, cowbirds still eat easy-to-gather insects because cattle stir the bugs just like bison did a century ago. And, so, today, even though the vast herds have been killed off, cowbirds continued with the parasitic trait they learned so many years ago. This entry was posted on Friday, May 27th, 2016 at 10:46 am and is filed under Natural History/Conservation, Wildlife. You can follow any responses to this entry through the RSS 2.0 feed. You can leave a response, or trackback from your own site.